Steering on axles 1 and 2. Wheels look good although the rear wheel should be larger. Barriers and firemen are from an optional kit. 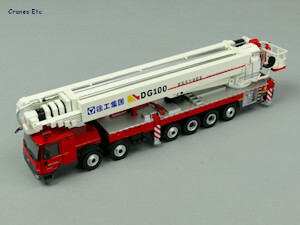 The XCMG DG100 is an aerial platform fire truck with a maximum working height of 102m. It is one of the largest of its type in the world. 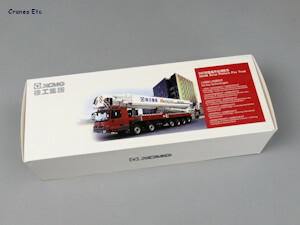 The model comes in an XCMG branded box and inside it, the model is contained within a pair of expanded polystyrene trays. 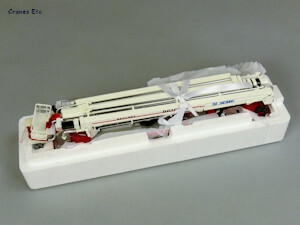 The model is covered with soft paper and tied with a ribbon. 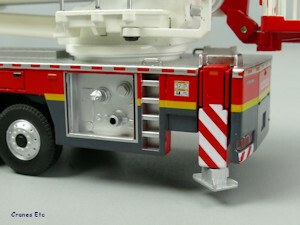 The top tray has space for a set of fireman figures, but these are not included with the model as standard. 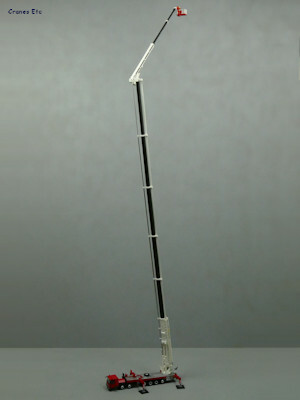 The review model had no missing parts, but one access step was detached in the box and was easily glued on. There is some information about the real truck printed on the box. Two tools are provided with the model: a pointer and a key. 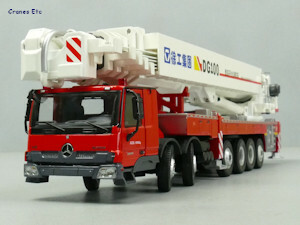 The truck chassis is based on a Mercedes-Benz Actros and the model is detailed in a simple fashion underneath, with the drive shafts formed in the base casting. The wheels look good, although the tyres are the same on all axles, and the model does not have the larger rear wheel seen on the real truck. The cab is nicely detailed with a grille, lights, and plastic mirrors, and the Mercedes-Benz logo. The interior detail is good too. The carrier deck has texturing, and there is a ladder and a spare wheel. On each side at the rear there is a connection panel for hoses, and there are grab rails and some tiny graphics. The outrigger beams are metal, and spreader plates are also included. 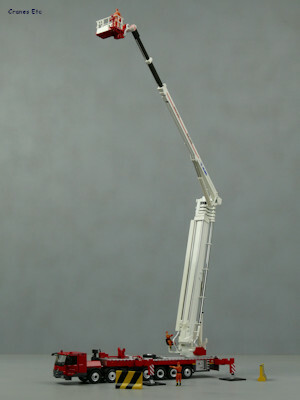 The boom is heavy and made up of two hinged sections, with the lowest section having sharp graphics applied. 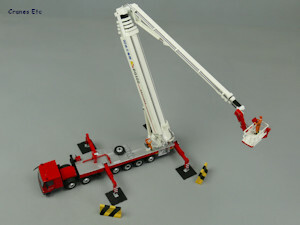 Twin hydraulic rams control the main boom and they have plastic jackets. The control bus is formed crudely out of thin metal strips. 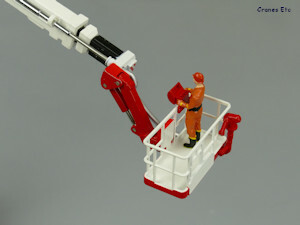 The work platform is made of plastic, presumably to keep the weight down. It has a simple control console and hose point. 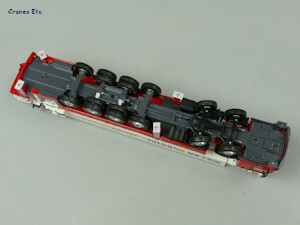 The model rolls well, although the loose steering on the linked front two axles wobbles a bit. There is sprung suspension on axle 2. Axles 3 and 6 look like they should have some steering function, but it has not been implemented. The two stage outriggers extend and the pads can be screwed down. There is quite a bit of looseness between the beams so they are not rigid. A swing out seat for the boom is provided. The main boom raises well and it can be locked at any angle by tightening grub screws in the ram jackets. The second boom poses well on its hydraulic ram. 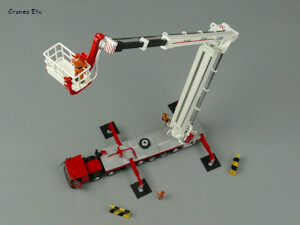 The telescopic sections extend smoothly and lock at full extension, and the hoses are telescopic too. At full extension the boom needs to be posed carefully to avoid any small sideways lean. The boom arrangement rotates well. 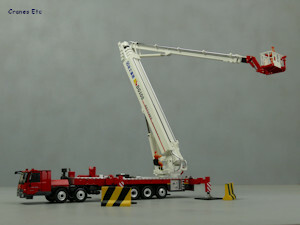 The work platform is adjustable on its jib. 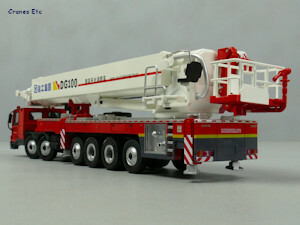 The model reaches an impressive height when fully extended but is about 30cm short of its proper scale height of 2m. It has a high metal content with some plastic used. The quality level is reasonable. It is good value given the overall size. 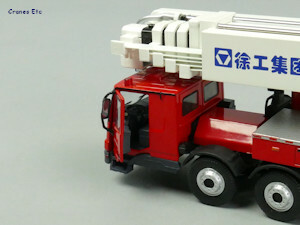 This is an interesting model by Yagao, and is something unusual for collectors of emergency vehicles. 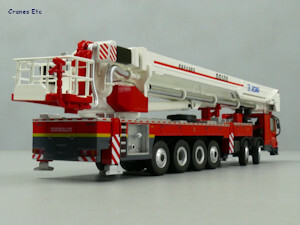 Its main plus point is the impressive size and it poses well with the optional Firemen Figures set. In the box with a nice ribbon. Impressive before anything is extended.